Headlight body … one　※The H4 valve is not attached. 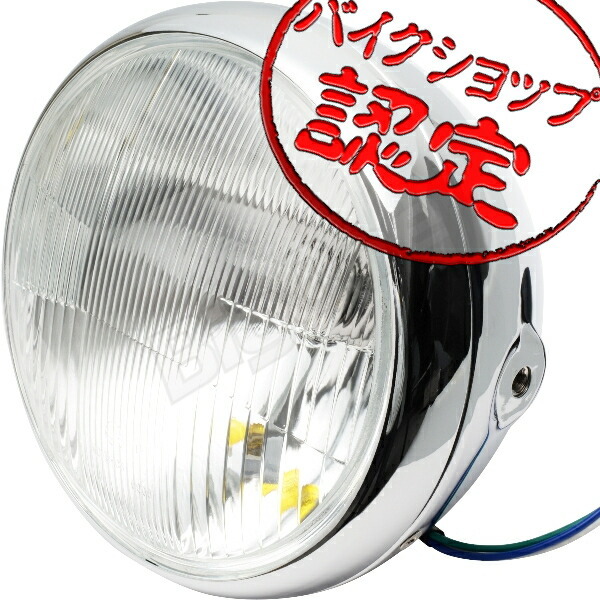 ※A headlight stay is necessary for installation separately. ※Installation, the instruction manual is not attached. ※Import goods have it, and there may be a manufacturing process and a scratch in the transportation middle. Instructions |I would like confirmation by all means for Japan use. When I am attached in you, and a product is damaged, and an accident occurs, the guarantee is not intended under any circumstance. As the guarantee becomes not intended under any circumstance, about the malfunction that it is worked, and the one except the motorcycle shop (mechanic of the shop) produced, please depend to a motorcycle shop nearby. In addition, I cannot answer in us even if I hear about installation. When there are any questions, I would like consultation toward the motorcycle shop of the neighborhood. ※You retighten the bolt of each part for preventing it from falling off, and, in the case of a bolted product, please attach it to the body. ※For accident prevention, I, please confirm whether a bolt tightens by all means after work completion. ※For a general-purpose design, the car model name with mention becomes for a search in a title, a correspondence car model. After approval, please consider beforehand.